1 For the dough: Sift flour into a bowl and mix with salt. In the center make a well and add the egg into it. Mix together, gradually adding about 1/8 liter (approximately 4 ounces) of water and knead to a smooth, firm dough. Wrap dough in plastic wrap and let rest for 1 hour under a warmed, upturned bowl. 2 For the filling: Combine Tilsit cheese with eggs, season with salt and pepper and add as many bread crumbs to make a moist, moldable paste. Roll out dough on a floured surface in portions and cut out thin out circles of about 7 cm (approximately 2 3/4 inch). Put 1 tablespoon of filling on the circles, fold them into crescents, press edges firmly and decorate with a fork. 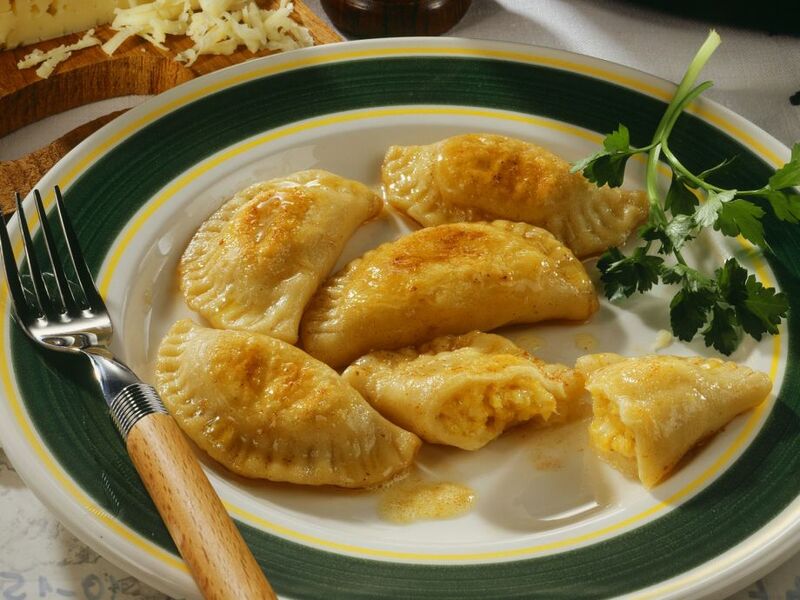 Heat salted water to a boil and cook Pierogi in portions. Once they reach the surface, reduce heat and cook for about 8 minutes. Lift out with a slotted spoon and drain. Fry in hot butter until golden brown and serve.